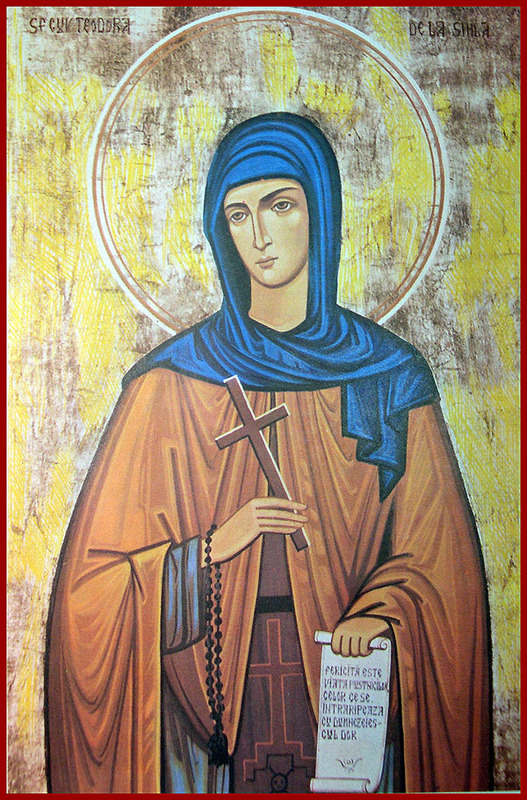 Saint Theodora, the greatest of Romania's holy ascetics, was born in the village of Vanatori, Neamts in the first half of the seventeenth century, and was the daughter of Stephen Joldea and his wife. She was married to a man of Ismail, but had no children. Therefore, she and her husband decided to enter the monastic life. Her husband went to the Skete of Poiana Marului, where he was tonsured with the name Eleutherius. He was also ordained to the holy priesthood. Theodora also received the monastic tonsure in the Skete of Poiana Marului. In just a few years, she advanced in obedience, prayer, and asceticism, acquiring the grace of unceasing prayer of the heart. 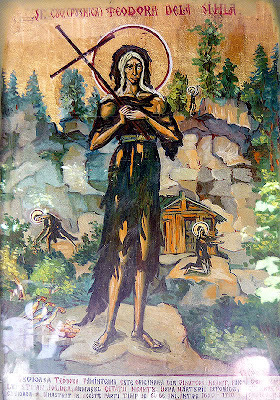 When her skete was destroyed by the Turks, she fled to the Buzau Mountains with her spiritual mother, Schemanun Paisia. They lived for several years in fasting, vigil and prayer, enduring cold, hunger, and demonic temptations. 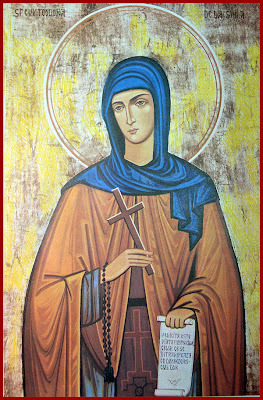 When her spiritual mother fell asleep in the Lord (1670-1675), St Theodora was led by God to the mountains of Neamts. After venerating the wonderworking Neamts Icon of the Mother of God (June 26) in the monastery, she was told to seek the advice of Hieromonk Barsanuphius of Sihastria Skete. Seeing her desire for the eremetical life, and recognizing her great virtues, he gave her Holy Communion and assigned Hieromonk Paul as her Father Confessor and spiritual guide. Fr Barsanuphius advised Theodora to go and live alone in the wilderness for a year. "If, by the grace of Christ, you are able to endure the difficulties and trials of the wilderness, then remain there until you die. If you cannot endure, however, then go to a women's monastery, and struggle there in humility for the salvation of your soul." 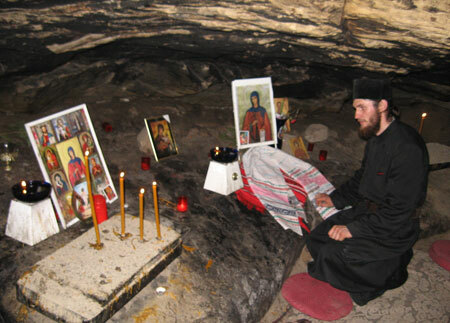 Fr Paul searched in vain for an abandoned hermitage where St Theodora might live. Then they met an old hermit living beneath the cliffs of Sihla. This clairvoyant Elder greeted them and said, "Mother Theodora, remain in my cell, for I am moving to another place." Fr Paul left Theodora on Mount Sihla, blessing her before he returned to the skete. St Theodora lived in that cell for thirty years. Strengthened with power from on high, she vanquished all the attacks of the Enemy through patience and humility. She never left the mountain, and never saw another person except for Fr Paul, who visited her from time to time to bring her the Spotless Mysteries of Christ and the supplies she needed to survive. St Theodora made such progress in asceticism that she was able to keep vigil all night long with her arms lifted up toward heaven. When the morning sun touched her face, she would eat some herbs and other vegetation to break her fast. 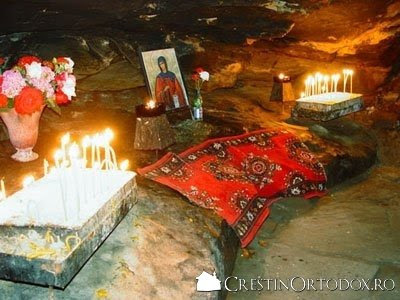 She drank rainwater which she collected from a channel cut into the cliff, which is still known as St Theodora's Spring. When Turks attacked the villages and monasteries around Neamts, the woods became filled with villagers and monastics. Some nuns found St Theodora's cell, and she called out to them, "Remain here in my cell, for I have another place of refuge." 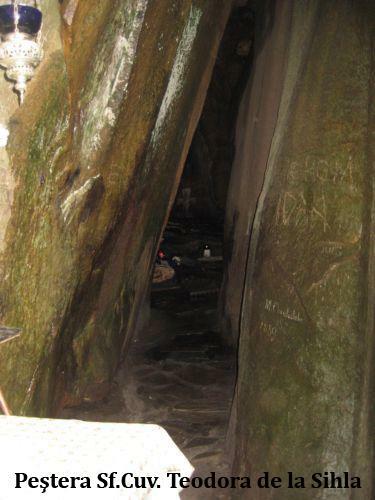 Then she moved into a nearby cave, living there completely alone. An army of Turks discovered the cave, and were about to kill the saint. Lifting up her hands, she cried out, "O Lord, deliver me from the hands of these murderers." 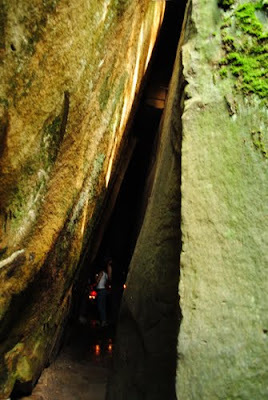 The wall of the cave opened, and she was able to escape into the woods. As St Theodora grew old, she was forgotten and there was no one to care for her. Placing all her hope in God, she continued her spiritual struggles, and reached great heights of perfection. When she prayed her mind was raised up to Heaven, and her body was lifted up off the ground. Like the great saints of earlier times, her face shone with a radiant light, and a flame came forth from her mouth when she prayed. 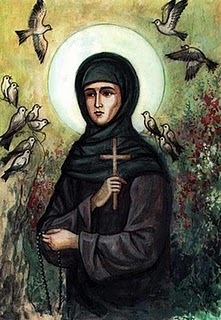 In time her clothes became mere rags, and when her food ran out, she was fed by birds like the Prophet Elias (July 20). They brought her crusts of bread from the Sihastria Skete. Seeing the birds come to the skete and then fly away with pieces of bread in their beaks, the igumen sent two monks to follow them. Night fell as they walked toward Sihla, and they lost their way in the woods. They decided to wait for daylight, and began to pray. Suddenly, they saw a bright light stretching up into the sky, and went to investigate. As they approached, they saw a woman shining with light and levitating above the ground as she prayed. St Theodora said, "Brethren, do not be afraid, for I am a humble handmaiden of Christ. Throw me something to wear, for I am naked." Then she told them of her life and approaching death. She asked them to go to the skete and ask for Fr Anthony and the hierodeacon Laurence to come and bring her Communion. They asked her how they could find their way to the skete at night, for they did not know the way. She said that they would be guided to the skete by a light which would go before them. The next day at dawn, Fr Anthony went to Sihla with the deacon and two other monks. 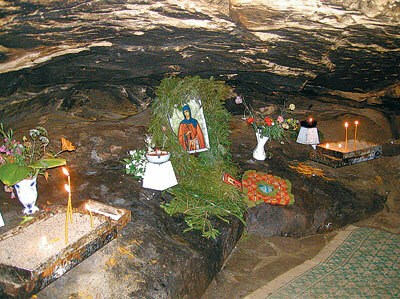 When they found St Theodora, she was praying by a fir tree in front of her cave. She confessed to the priest, then received the Holy Mysteries of Christ and gave her soul to God. The monks buried her in her cave with great reverence sometime during the first decade of the eighteenth century. News of her death spread quickly, and people came from all over to venerate her tomb. Her holy relics remained incorrupt, and many miracles took place before them. Some kissed the relics, others touched the reliquary, while others washed in her spring. 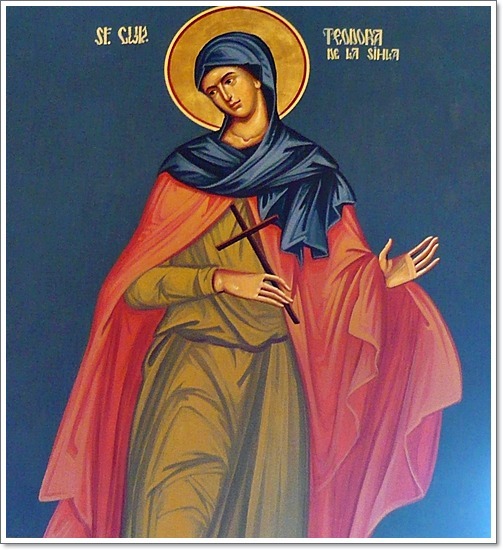 All who entreated St Theodora's intercession received healing and consolation. 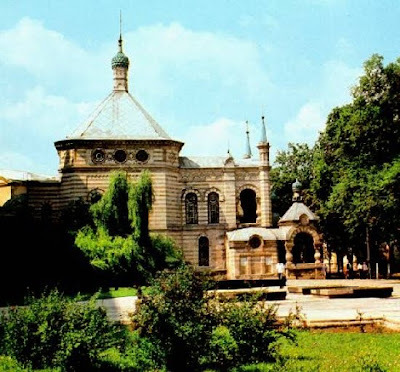 St Theodore's former husband, Hieromonk Eleutherius, heard that she had been living at Sihla, and decided to go there. He found her cave shortly after her death and burial. Grieving for his beloved wife, Eleutherius did not return to his monastery, but made a small cell for himself below the cliffs of Sihla. He remained close to her cave, fasting, praying, and serving the Divine Liturgy. He lived there for about ten years before his blessed repose. He was buried in the hermits' cemetery, and the Skete of St John the Baptist was built over his grave. 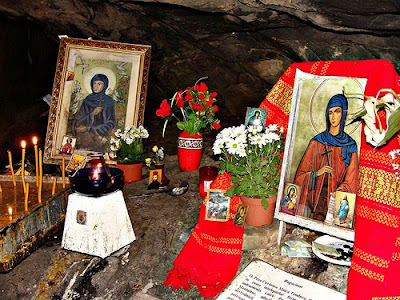 St Theodora's relics were taken to the Kiev Caves Monastery between 1828 and 1834. There she is known as St Theodora of the Carpathians. St Theodora was officially glorified by the Church in 1992. Cele pământeşti părăsind şi jugul pustniciei luând, te-ai făcut mireasă lui Hristos, fericită; cu postul, cu privegherea cereştile daruri luând şi cu rugăciunea pe îngeri ajungând, firea omenească ai biruit şi la cele cereşti te-ai mutat, lăsându-ne spre mângâiere peştera şi sfintele tale moaşte. Pentru aceasta, Sfântă Preacuvioasă Maică Teodora, roagă pe Hristos Dumnezeu să mântuiască sufletele noastre. Cele pamantesti parasind si frigul cel aspru al pustniciei in pesterile schitului Sihla asupra ta luand, te-ai facut mireasa a lui Hristos, fericita Teodora. Cu rugaciunea pe ingeri ajungand, cu postul si lacrimile de diavoli arzand, ai biruit slabiciunea firii omenesti si pe multi sihastri din Carpati intrecand, la cele ceresti te-ai mutat, lasandu-ne noua mangaiere pestera si pilda vietuirii. Sfanta, Preacurata Teodora, roaga-te lui Dumnezeu sa ne mantuiasca sufletele noastre.